When Bert Claster Productions in Baltimore, Maryland began syndicating a show that involved your average bowler, little did they realize that they were dealing with what arguably could be described as television’s first reality show. The program was titled “Bowling Fo r Dollars” and it hit the airways in the late 1960’s. In 1971, program manager Bruce Lawson bought the Canadian rightsand inserted it into a slot following the 6.30 Scan News. It became an instant ratings success. 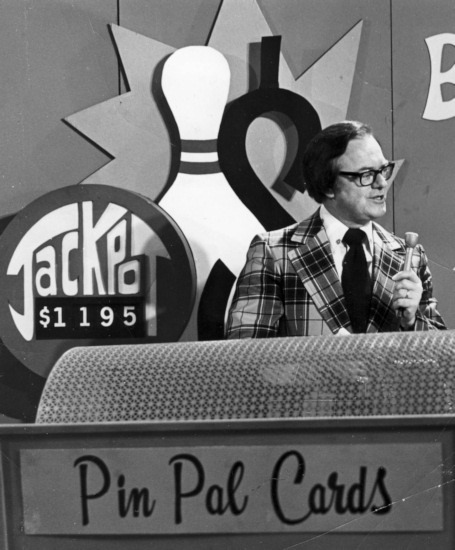 Episodes of Bowling for Dollars were taped at Twin City Bowl and the first host was Jim Craig who was followed by Bill Inkol (longest serving host), Jeff Hutcheson and Tom Knowlton. The largest jackpot ever won was $2,950.00 which was gradually built up over a period close to two years. 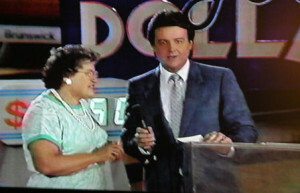 On the very next show it was won again, only this time the windfall was much smaller – $150.00. From year to year “Bowling For Dollars” audience numbers remained consistently high thanks to the popularity of 5 pin bowling good core audience and a chance to be on live television. Bowling for Dollars was a television game show on which people could play the sport of bowling to win cash and sometimes prizes based on how well they bowled. Jeff Hutcheson followed Bill as the Bowling For Dollars host and recently contacted us providing the following information….. I discovered this wonderful “trip down memory lane” website while perusing Dan’s Fisher’s website. I can update you on the Bowling for Dollars info. I took over the show in 1985, and continued to do it until 1992. At that time Tom Knowlton took over and I believe it lasted another two or three years and then went off the air. In the end, they had changed the format to 10 pin. When I took over the show in 1985, we actually increased the jackpot from $15 per miss to $25 per miss. At one point during my tenure, the jackpot climbed to over $9,000, meaning we didn’t have a winner for almost a year. There would be 7 bowlers on each show, and, by the end of my run, we would tape 9 shows on a weekend and did this 5 times per year. We would tape 3 on Friday night, 3 Saturday morning and another 3 Saturday afternoon. We would start tape, and NEVER stop, no matter what happened, and that includes a bat flying thru the bowling alley. Sometimes we were the only lanes going when we taped, and we would actually get some crew, or people waiting to be on the show, to throw balls down other lanes to make it sound busy! I only ever lost it once on the show (but tape kept rolling), and that was in my last season as host. The contestant pulled his ‘pinpal’ card from our bin, and I read the name cold, and I’ve never forgotten it to this day. Donald Twococks, from St. Catharines. Spelled as you see it. I still get recognized for doing bowling, as I’m sure Bill and Tom do. Bill Inkol also had a funny antidote to tell. This is from Dan Fisher’s wonderful KW Radio History site.